This crisp painting depicts a pre-Hispanic ruler of the central Mexican kingdom of Texcoco. His name is Nezahualpilli. He stands against an undifferentiated background in the regalia of a king—from his sandals to his cape and jewelry. While the image depicts pre-conquest forms of royal dress, the figure’s body owes its style to images brought to New Spain from Europe. This is a portrait that could only post-date the Spanish conquest of Mexico. Nezahualpilli came to power in 1472. He was known as a poet and wise ruler, who oversaw a court filled with other learned people. He died in 1515, before the Spaniards arrived in Mexico. His portrait, created over a century after his birth, shows the regalia of rulers. It includes a turquoise cape, with its patterned design on both sides. Some scholars believe such capes were made with a tie-dye technique (plangi), others think they were, in fact, decorated with actual turquoise beads. Turquoise sandals were reserved for royalty in the Aztec empire. Along with gold calf ornaments, bracelets, necklace and lip plug of greenstone, Nezahualpilli appears here dressed in his finest. The painter’s name is not known. 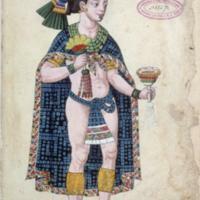 The manuscript is named for its first known collector, don Fernando de Alva Ixtlilxochitl (ca. 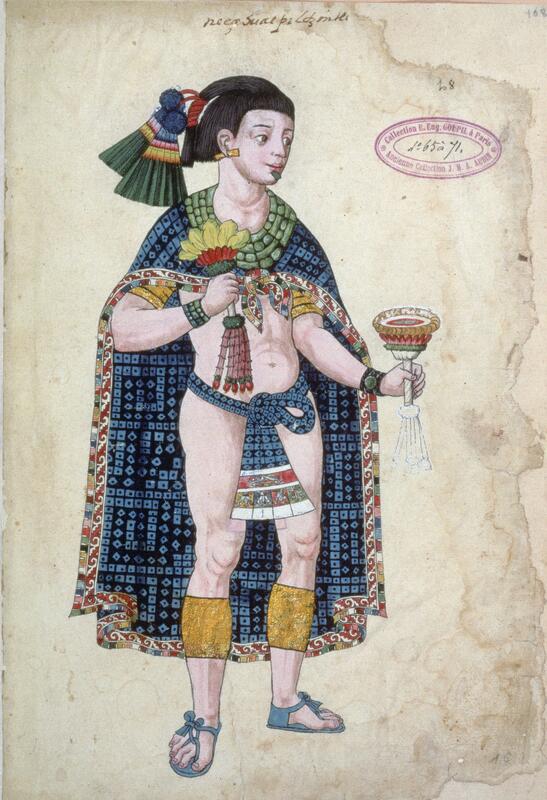 1578-1650), the mestizo great-great-great grandson of Nezahualpilli and collector of 16th-century manuscripts. This image seems to correspond to a text written by yet another mestizo of noble descent, Juan Bautista Pomar. The manuscript page measures 31 x 21 cm (ca. 12 x 8.5 inches) and has been written and painted on European paper. The torn edges were not part of the original, nor was the collector’s stamp in the upper corner. The Codex Ixtlilxochitl focuses upon the Aztec past—its rulers, deities and rituals—but takes the form of a European-style book. While its original, intended form is no longer known, today the manuscript is composed of several distinct sections. This image comes from the second section, which includes four full-length portraits (of which this is one). Today the manuscript forms part of the extensive collection of indigenous Mexican paintings in the Bibliothèque Nationale in Paris. This image, which draws upon other Mexican manuscripts of the early colonial period, suggests some of the ways that pre-Hispanic histories took on meaning in Spanish America. Documents that focused upon noble, royal and ritual histories—themselves early colonial creations—were collected, copied and recopied by educated mestizo elites (among others). In this way, manuscripts such as this one both preserved and reworked knowledge of the pre-Hispanic past. Aguilera, Carmen. 1997. "Of Royal Mantles and Blue Turquoise: The Meaning of the Mexica Emperor’s Mantle." Latin American Antiquity 8 (1): 3-19. Anawalt, Patricia Reiff. 1990. "The Emperor’s Cloak: Aztec Pomp, Toltec Circumstances." American Antiquity 55 (2): 291-307.